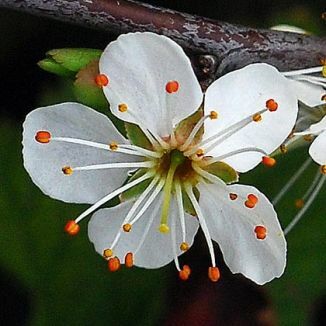 Blackthorn is not easily confused with other wild plants on this web site. This is a deciduous, sometimes dense, thorny shrub which grows abundantly throughout the country. 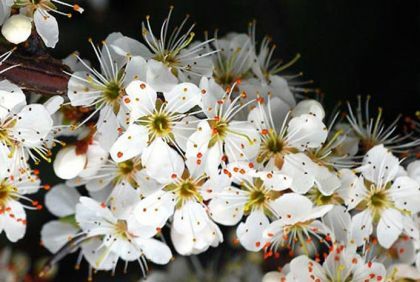 A lesson in contrast between the white blossoms and the black branches, from March to May the shrub carries the white, 5-petalled flowers (10-15mm) in short dense spikes which usually appear before the leaves which are oval and slightly toothed. The fruit, known as sloes, are bitter blue-black berries like tiny plums. Steeped for some months in gin with sugar, they produce the dangerous sloe gin! This native plant belongs to the family Rosaceae. I first identified this in 1976 in Laragh, Co Wicklow and photographed it near Wellingtonbridge, Co Wexford in 2007. From the National Folklore Collection, University College Dublin. NFC S. 36:247. From Laois.